George Dukes rolled his eyes. Thousands of miles from home and she was still nagging. He looked back and saw a couple walking toward the native. Probably felt sorry for him, the saps. Buba the Hunter continued praying to his gods in this strange place as the two outsiders approached, a man and woman. The woman was speaking to him, but used the language so oddly. He looked up. For two days, he had prayed to Gura and Rara for a way back to his village. Were these people their emissaries? I wrote this for the What Pegman Saw writing challenge. The idea is to use a Google maps image and location as the prompt for creating a piece of flash fiction no more than 150 words long. My word count is 149. 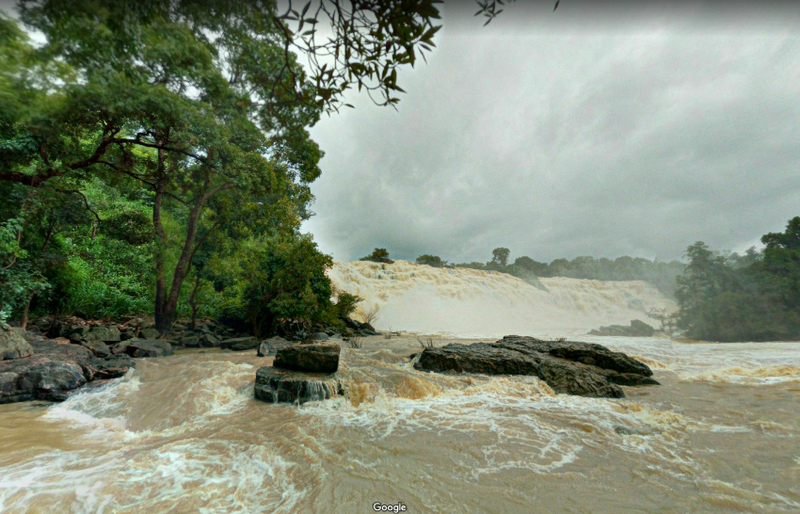 Today, the Pegman takes us to Gurara Waterfalls in Nigeria. I looked it up on Wikipedia and discovered the falls were thought to have been discovered in 1745 by a Gwari hunter named Buba. The falls and river are believed to have been named after the two deities Gura and Rara. In keeping with my recent science fiction stories The Devil from the Fire and Blood Libel, I decided to dislocate Buba in time, though not in space. Today, the falls are a tourist attraction complete with a resort boasting a recreation center and seven-star hotel. I populated that hotel with modern “ugly American” tourists, but also with physicist Everett Carson and his companion, historian and linguist Aiyana Zheutlin (originally a character from my “Time Traders” books, written as a homage to the works of Andre Norton [the late Alice Norton]). They’ve come to take Buba to the phenomenon (out of public view in this wee tale) and back home. I like the way you’ve assembled the characters of this story, and sketched in plausible relationships. Buba must have been one confused hunter by the time he got back to his own time! Nice one, James. Given his culture and belief systems, he no doubt would consider his experiences to be a supernatural vision, though how he would interpret its meaning might be a difficulty. Thanks, Penny. Great story, James. As Arthur C. Clarke said, “Any sufficiently advanced technology is indistinguishable from magic.” We all must fit our impressions into what we understand. After all, if the sun actually did rotate around the earth, it would look exactly the same as it does now. Actually, I’d love to talk to a physicist about that one. It would make a great fantasy/alternate reality tale about an Earth really being the center of the Solar System if not the Universe. Clarke’s first law: When a distinguished but elderly scientist states that something is possible, he is almost certainly right. When he states that something is impossible, he is very probably wrong. Yes, but fiction and fantasy are fun ways to explore the impossible. Clarke’s second law. The only way of discovering the limits of the possible is to venture a little way past them into the impossible. While Buba was praying for return to his time, I was praying George would fall into the falls. I liked your conjecture about how Buba would interpret his experience. Thanks, Karen. Americans tend to make terrible tourists, and expect the rest of the world to offer them McDonald’s and “Disneyworld,” which actually sometimes it does. What’s the point of traveling if you expect to take home with you? Thousands of miles from home and she was still nagging. For the last name, I looked up typical American Southern names. I settled on “Dukes” because I remembered the old TV show “Dukes of Hazzard.” Not slamming all southerners, but sometimes the stereotype is true. – and I did think a bit royal for a second – but that is with singular Duke. and have you ever heard of the rappin duke? I suspected there was more to that couple than was shown in that one short story! I’m glad to hear that, unlike the rude tourists, those two recognize Buba’s situation and are able and willing to help him! They certainly recognized him as a man two-and-a-half centuries out of place. Fortunately, they were able to return him home. So far, Dr. Carson Everett and company haven’t failed, but there’s always a first time. Lucky for him they were in the right place, at the (ahem) right time! It would be disconcerting to end up in another time and not know how you got there. The disjointed feel of this should jar, James, but it does not. I like the seamless way you have joined these two story journeying segments. Glad you liked it, Kelvin. When differing worlds collide, it is often jarring and disjointed. Thanks, Lynn. In this scenario they are successful, but he’ll have quite a story to tell. This was an interesting take. I guess they are emissaries of his gods in a way. At least he has a belief system which will allow him to explain events. Yes, they certainly could be. It’s like a Christian praying for help from God expecting something supernatural to happen, and then an ordinary person comes along and does something that actually answers the prayer.